Court article tiré du site "Pulpfest" (http://www.pulpfest.com/2015/02/coming-soon-la-vintage-paperback-collectors-show/) annoncant la tenue prochaine du salon. Although PulpFest 2015 is still over six months off, do not despair. There are other collectors conventions fast approaching. 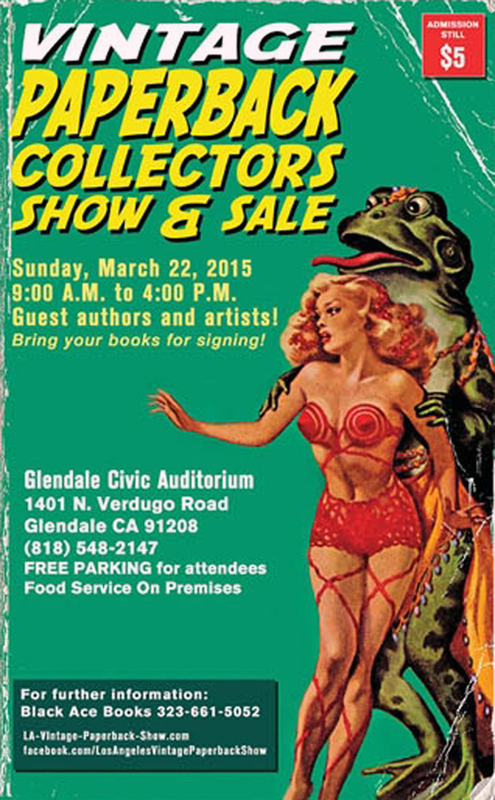 For instance, on Sunday, March 22nd, the Los Angeles Vintage Paperback Collectors Show will take place in the Glendale Civic Auditorium at 1401 North Verdugo Road in Glendale, California from 9 AM to 4 PM. 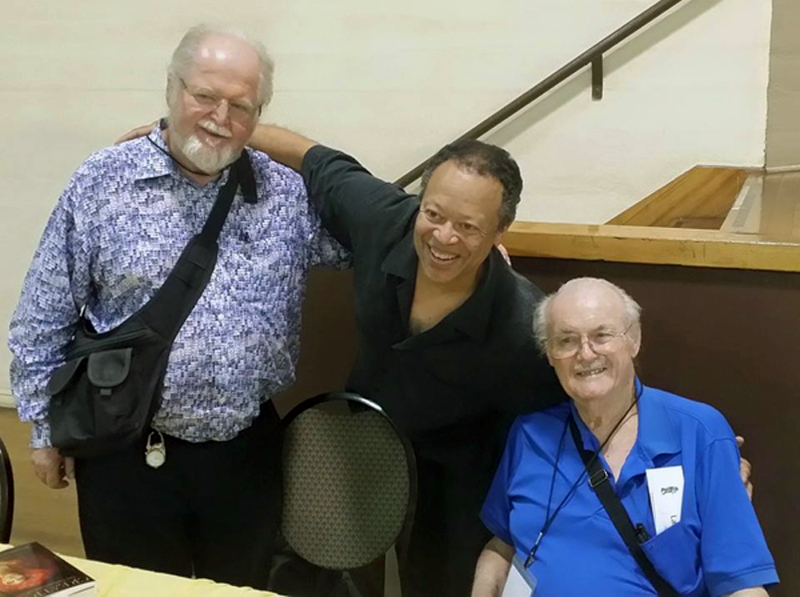 It’s still the best bargain in town, featuring an admission price of five bucks!Now in its 36th year, this convention was started by Tom Lesser, who invited dealers, fellow collectors and paperback enthusiasts to his home in Chatworth, California in 1980. 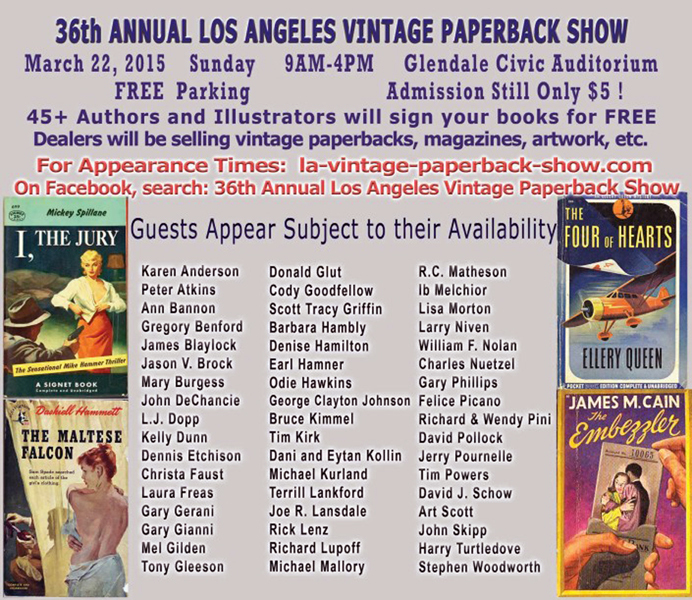 Since then, it has grown to be the world’s largest vintage paperback gathering. This year’s show will feature more than 80 dealer tables with tens of thousands of vintage paperbacks for sale, from inexpensive filler copies to the most elusive and rare collectibles in the hobby. In addition to collectible paperbacks, you’ll also find pulp magazines, original illustration art, hardbound science fiction and mystery books, and more. There is no telling what might show up!Over the years, an important attraction of the show has been its exciting roster of guest authors and artists. It has included such notables as Robert Bloch (18 years); A. E. Van Vogt , Ray Bradbury, Poul Anderson, and Fredrik Pohl (all for over 10 years); and the show’s champ, William F. Nolan (with over 30 years of appearances). This year the show will feature approximately fifty guests who will be available to meet the attendees and sign their works for free! Click here for a schedule of this year’s guest writers and artists. Cette convention fondée par Tom Lesser en est à sa 36ème année d'existence. Celui-ci commença par inviter à son domicile de Chatworth en Californie en 1980, des bouquinistes, des amis collectionneurs et des amateurs enthousiastes de "paperbacks". Depuis cette époque le salon est devenu la plus importante manifestation mondiale dédiée aux livres de poche, principalement américains bien sûr. Cette année le salon sera occupé par plus de 80 tables de revendeurs offrants à la vente des milliers de livres de collection, du plus courant au plus recherché. On pourra aussi trouver quantité de pulps et magazines, des illustrations originales, des ouvrages brochés dans les domaines de la science-fiction et du roman policier, et bien d'autres choses.